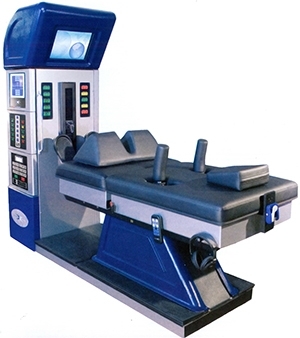 Spinal decompression using the DRX 9000 is established as the premiere conservative treatment option for spinal disc disease. When appropriate candidates are treated, lasting relief can occur with as little as 1 week of treatment. This technique uses a variety of metal tools that are rubbed on an area of pain to break down soft tissue scarring or fibrosis. This is a more aggressive technique than massage and usually offers quicker and longer lasting relief. There is no substitute for this treatment when indicated. Soft tissue fibrosis is often the cause of chronic pain syndromes and must be addressed to offer quick pain relief. Therapeutic massage therapy is offered at this facility to soothe those aching muscles quickly. 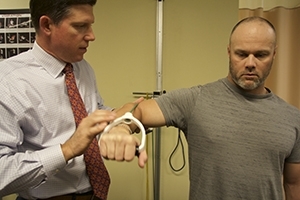 Injured soft tissues can heal with restricted motion. Restoration of that motion often requires compression and active stretching of the affected muscle group. Using this technique when indicated can offer rapid and lasting relief of pain. When a person experiences pain for periods of time, movement patterns and muscle strength can degrade. Posture is also affected often. Postural correction for chronic pain is crucial to maintain relief. Rehabilitation focused on the specific dysfunctional motor units and/or shortened muscle groups can provide fast and lasting relief of pain. Spinal manipulation is a technique that has been in use to relieve pain fast for thousands of years. When applied and performed appropriately, this technique has few rivals for fast pain relief. In our office, this is always performed to patient tolerance and should never be painful.